I absolutely love seeing what other people do to get ready for occasions, and how they do their hair and makeup; so, I thought I would do the same for my friends hen party. This hen party is a night out in good old Newcastle, doon the Toon! I have very oily skin and it’s quite problematic with spots, so I’ve taken step by step photo’s so you can see how my skin gets covered and how I look from start to finish. All the photos of my face are unedited to make them more realistic. After the usual dying my hair (it’s very patchy, I don’t even know why I continue to try and do it myself), showering, shaving and moisturising with Coconut Oil. I go straight into makeup. I start priming my skin using the Benefit Porefessional Matte Rescue, mostly around my T-zone, where I get oily. I take my Rimmel Match Perfection Foundation in the shade True ivory and use a brush to buff that into the skin. This is a great foundation for July since it has SPF 20. I’m using my Collection Lasting Perfection Concealer to cover up those bad boy spots, and to lighten my dark circles under my eyes – I’m a very tired 24 year old. It’s in the shade Fair so it’s slightly lighter than my foundation, and I buff that in using the same brush because I’m lazy and don’t have time for washing a million brushes. I set my base makeup using the Rimmel Clear Complexion Powder in transparent. I always go for eyes second because they take the longest to do, and I like to get them out of the way. I shape and fill in my eyebrows using the Soap & Glory Archery Brow Tint & Precision Shaping Pencil, using only the felt tip end. As it’s a night out on the town, I’m going for slightly darker brows than my every day look, and I brush them through with a spoolie. I’m using my Sleek Eye Shadow Palette in Au Naturel for the whole eye look, starting with the shade Toast as a base over the whole lid. I then use Taupe on top of that, which is a really pretty shimmer beige. Using a different brush, I use Conker on my outer corner and crease and blend that out. I use a Bourjois Mineral Pigment, which I completely forgot to take a photo of – and lightly dust this over the finished eye shadow. It’s a very shimmery white-clear powder, and it just adds a little extra sparkle. I line my upper lashes using the Model Co Crayon in black, and smudge that out with a brush to create a very light smoky eye. I use my Laqa & Co Eyelighter on my waterline to create a more awake effect. I’m not going too heavy with dark colours because I know I’m wearing large false lashes and a red lip. I use the Ardell Demi Wispie false lashes in black. A night out is the only time I can get away with false lashes usually! I finish off with my trusty Maybelline The Falsies mascara on both my upper and lower lashes. I move onto contouring, using the Rimmel London Kate Trio in Coral Glow, which has contour, blush and highlighter all in one handy little package. I use an angled brush to apply and blend out the contour onto the hollow of my cheekbones, and slightly down my nose to make it appear smaller. I use the blush on the apples of my cheeks. This blush is great for summer as it’s slightly darker than what I’d usually go for. I use the highlighter on my brow bone, down my nose, on the top of my cheekbones and on my cupids bow. I finish off the whole look with my Rimmel Kate Lasting Finish Lipstick in the shade 110, which is a really gorgeous pop of colour. I have naturally straight hair so I tend to curl it for occasions like this to feel more dressed up. I used my VO5 Heat Protect Styling Spray and I already blow dried my hair using the L’Oréal #TXT Wave Creating Spray to add some texture to my hair and hold the curls better. I curl my hair using my GHD Straighteners, sectioning it in half. I curl away from my face and don’t worry too much about getting perfect curls. I run my fingers through it, to mess it up and loosen the curls. I finish with the VO5 High Volume Hairspray. 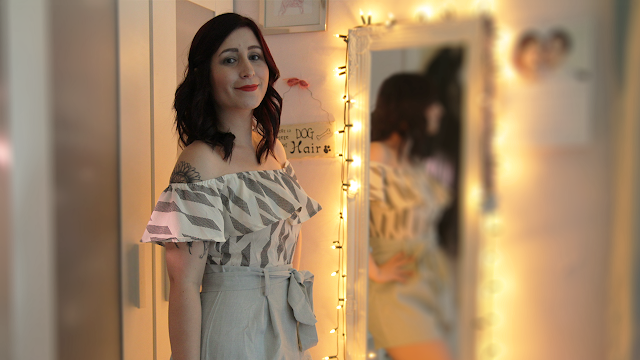 For my outfit, I’ve chosen a SUPER cheap playsuit that I found on Amazon for £10! Can you believe that? I’m so impressed with it. It has high-waisted grey shorts with a white top and grey pattern. It’s off the shoulder and ties in at the waist too, so It’s very flattering on my body shape. I’m very pleased with it. I’ll pair this with some black heels and a red bag to match my lips, and I’m good to go. July My Geek Box + MYSTERY Box! GIVEAWAY - A Month of Blogging - THANK YOU! 100 Quick Questions - Get To Know Me!